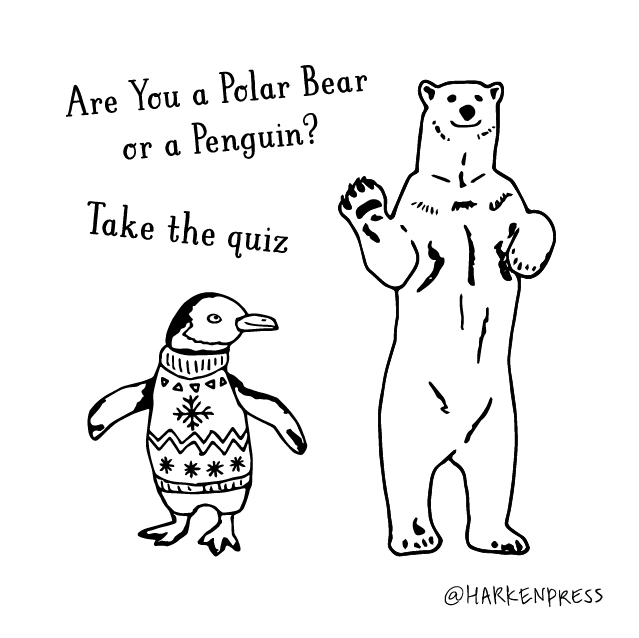 You've been dying to know – is your spirit animal a polar bear or a penguin? The colder weather has brought on your intense love of Arctic animals. They are so darn cute, especially in a holiday sweater, right? Take the short quiz below and find out what your personality is. I can't get enough of these adorable critters, they inspired 2 new holiday greeting cards in my latest product launch – Polar Bear Snow Globe card and the Penguin Sweater card. I'm so happy people are loving them as much as I do, so I want to make it even easier for everyone to gift them this holiday season. Take advantage of this sweet deal to stock up on holiday cards for your out of town family, friends, and co-workers. These penguins and polar bears, along with ALL HOLIDAY CARDS are now 30% OFF for a limited time! Use code HOLIDAY30 at checkout. Offer ends Sunday, December 3, 2017 at midnight (PST).